As you may or may not know, I hate mushrooms. The flavor isn't a problem, really... it's a little funky, but then, I eat pho, and it tastes a little like sweaty feet smell. By the way, I think it is the duty of every Pho restaurant to have a clever name. 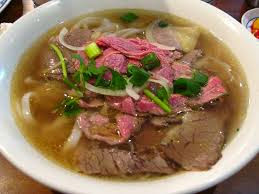 I'm a fan of Pho Shur! and What the Pho? Both are actual places. But anyway, back to mushrooms. It's a texture issue, and when I was very young, we were out eating Chinese, and my sister identified one in my soup as an "octopus eyeball". Nope. Anyone who knows me, knows I'm not a fan. That said, every few years, I try them again to see if maybe I've changed. So far, no dice. But the thing is, that's a good rule of thumb for food you don't like, because things can change. 1. When I was younger, I would only eat the filling in deviled eggs. I found the yolk rubbery and off-putting, probably because I watched my mother do the same thing for years. Then, I was at a party in my 20s. Not a family thing where I wasn't subject to scrutiny, but among peers, who I was trying to impress. So I sucked it up and ate the whole deviled egg I had put on my plate. And I liked it. Now I eat egg salad, hard boiled eggs, and delicious devils like there's nothing to it. 2. Green peas. As a kid, I hated them. I found the smell off-putting - my father described them as smelling like lightning bugs, and I agreed. Nope. Then, when Matt and I were in Italy, we went to dinner one night, and although we didn't specifically order them, the waiter came to the table with a bowl of fresh green peas. They did not smell funky at all. They had butter melting on them, and they looked like little emeralds. And they tasted SO. DAMN. GOOD. So as it turns out, I don't like canned peas. Fresh, or really even decent frozen peas are AOK. 3. Sushi. I tried sushi when I was in High School and I was like... meh. It was cold fishy rice, and I wasn't impressed. Then a few years ago, I ended up at a sushi place with a colleague, and as it turns out, I don't like crappy grocery store sushi. Fresh sushi? Totally different story. Now, I don't get into the sea urchin and eel - again, texture, but... 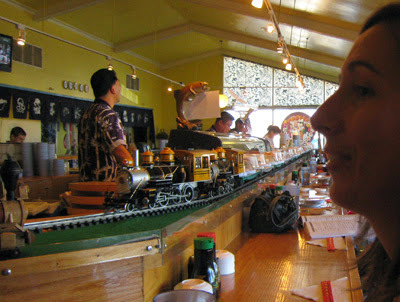 I can hold my own at Sushi Train any day. I have eaten at both, and it's hard to say which I love more. 4. Raw Oysters. My parents, namely, Dad - used to eat the living hell out of these when we went to Florida. I usually stuck to fried shrimp. But cut to New Orleans, 2012. I'm sitting at a dinner with a bunch of customers and the guy sitting next to me offers me one of his oysters - insists they're amazing. Well, I had tried raw oysters at the insistence of my Aunt Mary as a teenager and couldn't appreciate them. But I wanted to impress my customers with my worldliness, so I hooked one up with some cocktail sauce and it was excellent. From that point forward, if I was out with people and they wanted to get a dozen for the table, I'd help out. 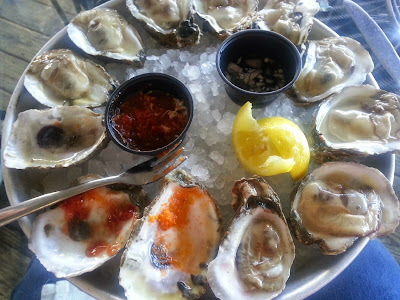 But today, I had the opportunity to get some Apalachicola Bay oysters - the great, great grandbabies of the ones Dad ate, and I got my own dozen. I accidentally ate two before taking the picture. So, eat, drink... be adventuresome!